Mount Kenya, a stratovolcano in the East African Rift system, is second only to Kilimanjaro in elevation among African summits. The peak of Mount Kenya. Kenya is a beautiful country with an amazing degree of topographical contrast. The country is located in the East African region and crossed by the equator. It has a total area of 586,000 square kilometers, and it borders Somalia, Uganda, Tanzania, Ethiopia, and South Sudan. Kenya is characterized by low-lying coastal regions with coral reefs and islands. The southern part of the country consists of high plateaus while the north is an arid and semi-arid desert. The country is bisected by the Great Rift Valley which contains seven lakes, both salty and freshwater lakes. Kenya is also home to some of the highest mountains in East Africa, several of which are highlighted below. Mount Kenya was named “Kenya” by Dr. Johann L. Krapf, a German missionary, in 1849. The highest peak of Mount Kenya is Batian at an elevation of 17,057 feet. Other major peaks on the mountain include Nelion (17,021 feet) and Lenana Point (16,355 feet). 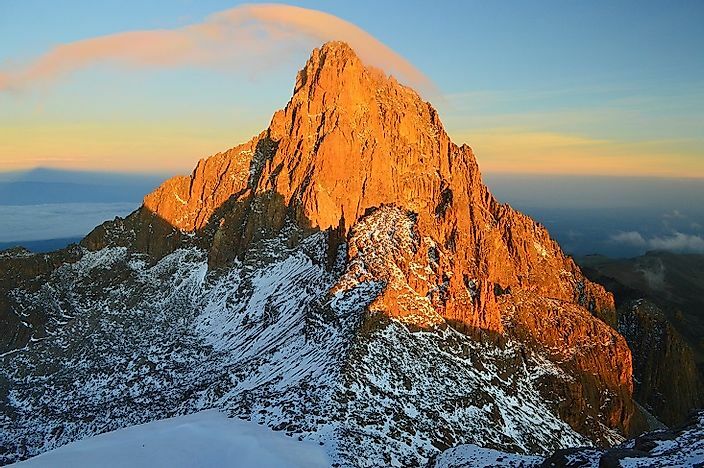 Mount Kenya is a stratovolcano which was formed around 3 million years ago, and it was covered by an ice cap for several years before glaciations which has eroded its slopes. The slope of the mountain is covered by forests which are important water sources. The forests consist of alpine species such as giant lobelias and rock hyrax. The mountain is a main water catchment area for Tana and Ewaso Ng’iso Rivers and also a source of water for over 2 million households. The wildlife inhabiting Mount Kenya includes antelopes, tree hyrax, hyena, buffalo, elephants, and leopards. Mount Elgon is found situated along the Ugandan-Kenyan border, just to the north of Kisumu City. The highest point of this extinct shield volcano, Wagaga, is located entirely in Uganda and measures 14,177 feet in elevation. Mount Elgon is Kenya’s second highest mountain and Africa’s seventeenth highest and it is estimated to be 24 million years old, the oldest extinct volcano in East Africa. The mountain consist of five major peaks, including Wagagai (14,177 feet), Sudek (14,114 feet), Koitobos (13,852 feet), Mubiyi 13,816 feet), and Masaba (13,652 feet). The mountain also consists of other features, including its caldera, its warm-water spring, Endebess Bluff, and several caves. Mount Elgon is a water catchment area for rivers such as Suam, Nzoia, and Lwakhakha. The vegetation around the mountain includes such species as Romulea keniensis, Echinops hoehnelil, and Ardisiandra wettsteinii. Mount Satima is the highest mountain in the Aberdare Range. The mountain is also called Ol Donyo Satima, which translates to “Mountain of the bull calf.” The highest peak of the mountain lies to the northern side of the Aberdare at the height of 13,127 feet. Mount Satima is a craggy bluff of rocks and tussock grass. The mountain is characterized by rainforest which transition into the bamboo forest and then to Moorland. Mount Satima is rich in plants with over 150 species including cedar and Podo. It is also part of water catchment area for both Ndakaini and Sasumua Dam which are primary sources of water for Nairobi City. The mountain is part of the protected area in the Aberdare Range. Some of these mountains, such as Mount Kenya, are considered sacred, and serve as traditional places of worship for the local communities. These communities believe that the gods and spirits inhabit the mountains, and thus they offer special prayers while facing the mountains or swear in the name of the mountains. Some cultural practices such as circumcision are also conducted around or on top of mountains. Hiking and mountain climbing are some of the joint activities carried out by both locals and foreigners on most mountains in Kenya.